In May we spent 7 days in Paris and, as bookstore owners, we visited a number of bookstores there, including Shakespeare and Company. On Monday nights Shakespeare and Co. has English language readings, and we were lucky to catch a reading by Cara Black and Leighton Gage. Both are published in the Soho Press mystery series, with Cara Black setting her books in Paris (murder in the marais, murder in montmartre, murder in the latin quarter...) and Leighton Gage setting his in Brazil. Both readers gave short readings and then answered questions. 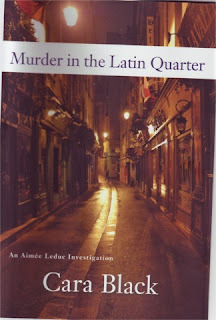 Cara Black introduced a Parisian police inspector from whom she has learned much about criminal investigation in Paris. He gave a brief account of his work on the Princess Di case, saying that there are 20 deaths per day in Paris, but because of political and media pressure, a large amount of time had to be spent on this case, resulting in a 3,000 page report! We were already fans of Cara Black, and do carry her novels in the store. Now we will add Leighton Gage to the selection as well.